The Price of Evil provides an interesting mechanical approach for generating spirit infested real estate on the fly. 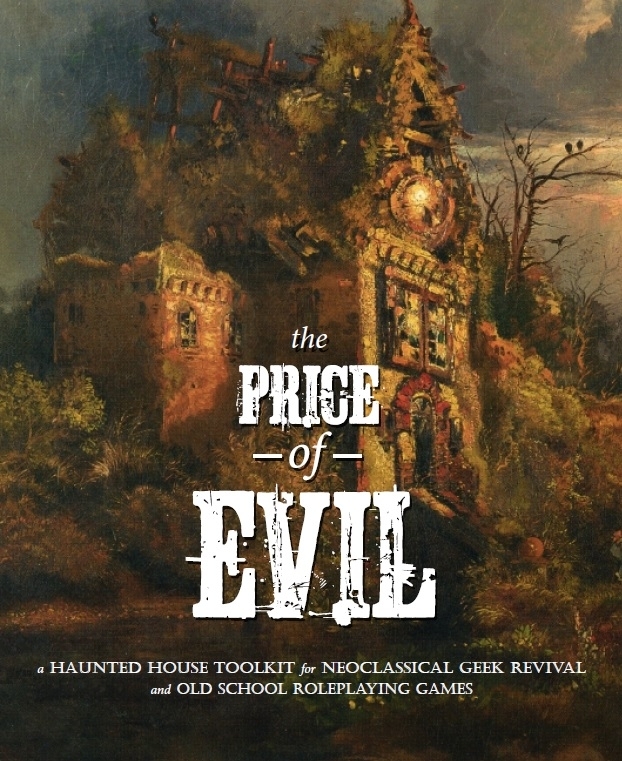 Written by Zzarchov Kowolski for Neoclassical Geek Revival and other Old School Renaissance games, The Price of Evil is a handy tool for The Cthulhu Hack. To create a haunted house you need a pack of cards. You can generate a house in advance or, at a pinch, do something on the fly. You follow one of the standard layouts provided – including fixed features like a lobby and master bedroom – dealing out cards and interpreting the value and suit to determine the purpose and contents. A heart denotes the default states, while the other suits equate to valuables (diamonds), accoutrements of the occult (spades) or damage (clubs), whether through vandalism, infestation, the elements, or the passage of time. The play of cards determines the presence of certain rooms depending on the floor, all drawn within the limitations of the layout. Drawing more than one Unique Room leads to the presence of a Junk Room instead – which reminded me of investigating the old Corbitt House in The Haunting. The sort of house generated suits those Lovecraft would have been familiar with in his time, with gabled roof, expansive attics and cellars, and impressive entrance halls. You can certainly tweak the state and descriptions to suit countries other than the US. Written for a fantasy role playing game, the text uses coins of differing value by metal. For general reference and conversion, assume that a Gold Piece = a Dollar, so that gold, silver and copper pieces directly convert to dollars, dimes and pennies. Therefore, if the characters discover 120 copper pieces in a locked box, they in fact have found a bunch of coins, mostly pennies, that amount to $1.20 in value. Dollar values might be in bills or coin, with the former more likely to suffer destruction where vandalism or possession have occurred (or occur). Throughout the house, the values assume that the property lies within a good district and the previous owner purchased quality products. Half the values for a more standard affair or cut to a third in poorer districts. Whatever the value of individual goods, a character selling anything on will need to find a buyer and few will offer catalogue/shop window prices for anything. For characters looking to “flip” a property – or assist a landlord in doing the same – the overall value of a house depends on overall condition, sound construction, fittings and reputation. If the characters takes weeks or months to resolve the “issues” associated with a property, they’re as likely to rubbish its reputation and leave it devalued. Originally written with a fantasy setting in mind, most rooms nevertheless translate seamlessly to a more modern setting. However, where anachronisms exist, either allow for them with rumours of odd behaviour in previous occupants or update the offending articles. If your house includes an Armoury, for example, replace the content with suitable alternatives, like survival/hunting gear, revolvers, shotguns, and so forth. Drawing diamonds in this instance might suggest a selection of antiques, explaining the oddities – and necessitating an adjustment in market value. Drawing spades could suggest oddities, artefacts from overseas, esoteric paraphernalia or simply signs of the unhinged and weird. Where the text references Oppression inflicted by events or haunting entities, assume a test of Sanity. If the Oppression inflicted equals or exceeds half the highest value of the die thrown, roll with Disadvantage. For example, shaky investigator Henry Alwood – Sanity d6 – enters the vaulted observatory, perched on the top floor of the house, in the middle of the night. The oppressive forces of the house twist the fabric of the room, causing the rug-strewn timber floor to dissolve beneath Henry’s feet, threatening to drop him into the unforgiving void. The manifestation rates three skulls – meaning the Oppression matches half the highest value of the character’s Sanity Die (max value of 6 divided by 2 = 3). The player rolls two six-sided dice instead of one and the GM will force them to use the worst result. I suspect, given a little thought, you might find a way to run solo adventures using The Cthulhu Hack and a house generated with this excellent toolkit. You might also wanted to seek out suitable ‘solo gaming tools‘ to stand in as GM for your session. For group gaming, it means you can spice up a session with a genuinely odd and unexpected haunted home; or, perhaps, the investigators can face the challenge of ridding a property they own of unwanted spirits. When they get that letter about their recently departed great uncle, the envelope weighted down by an odd looking key, the value of the inheritance may depend on their surviving a night in the property – or slogging through months of research and effort. A haunted house might even serve as a quirky sub-plot; perhaps something in the house could serve to benefit them in handling another case. As Zzarchov wrote The Price of Evil for the OSR, you can use any stats provided for spirits straight off the page, referring to the antagonist table in the core rules to determine baseline damage for any direct corporeal attacks or even indirect assaults. If you want to flesh out a manifestation, a roll or two in the horror generator of From Unformed Realms can provide the taint or spoor of evil; enough detail to provide a clue or flesh out the fleshless dead without needing a full blown entity. You can purchase The Price of Evil from RPGNow and DriveThruRPG.